Disruptive technologies in pharmacy, reality or myth? 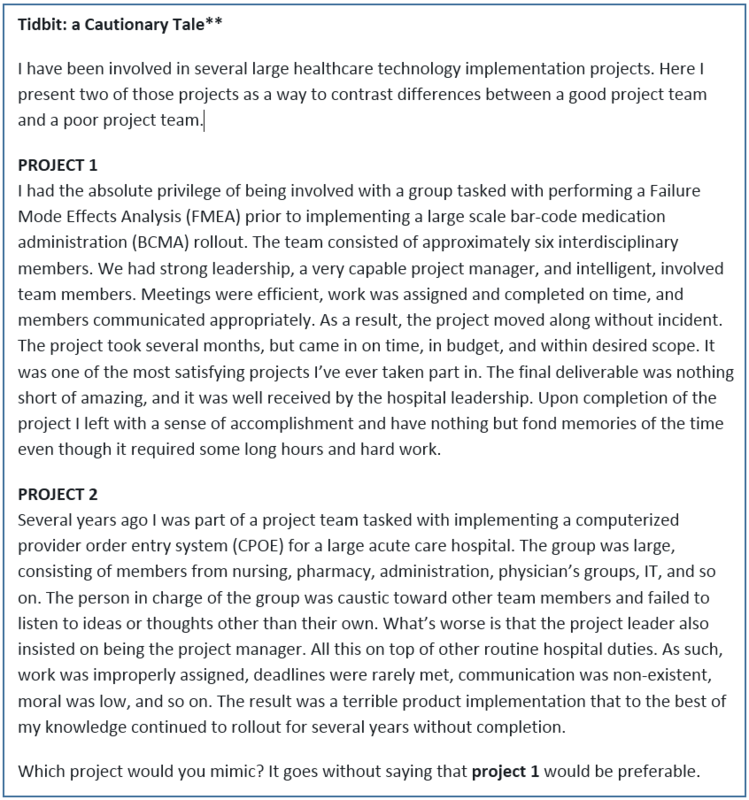 There was an interesting thread in one of the ASHP practice forums recently. Someone asked whether or not pharmacists were “ready for the future that the opportunities these disruptive technologies offer”. This in reference to technologies that they saw in the exhibit hall at ASHP Midyear. 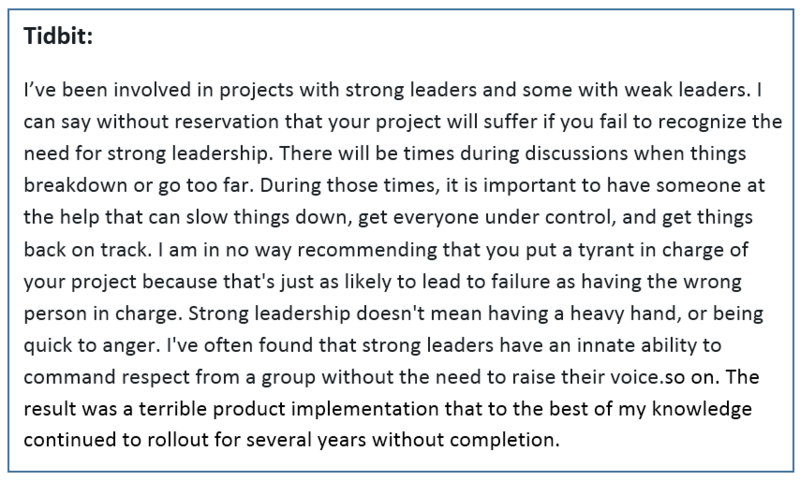 The ASHP forum thread produced some interesting responses. One pharmacist pointed out that healthcare disruption will come from outside of healthcare. I agree with that opinion 100%. However, someone responded that they didn’t think this was “… a foregone conclusion” because they think that “…in the short to medium term, in order to actually make meaningful improvements in outcomes, healthcare needs to be disrupted from within”. I almost snorted coffee out of my nose when I read that. It was that funny. I’ve been a pharmacist for more that 20 years. In that time, pharmacy hasn’t disrupted anything. Nothing. Nada. Pharmacy departments are so busy keeping up with regulatory requirements and chasing elusive “clinical activities” that they don’t have time to innovate and disrupt. And that’s just flipping through my posts from the past few years. I can’t imagine what I’d find if I went all the way back to the birth of this weblog in 2009. Is there a healthcare company out there that will disrupt pharmacy? Not likely. As a really smart lady once told me, no one wants to be in this space because it’s hard and you can’t make any money. What about companies from the outside? Also not likely for the same reason. If it sounds like I’m bitter about all this, it’s because I am. Pharmacy practice could be so much more if we’d just crawl out of our holes and do something different from time to time. Here’s the bottom line, pharmacy needs to be disrupted — desperately. However, it’s not going to happen. The best we can hope for are iteratvie changes, at best. (1) I’ve actually had a few ideas turn into real products. Nothing earth shattering, but cool nonetheless. A week or so ago a colleague tagged me on Twitter in reference to a Reddit post in which my name, or rather my site jerryfahrni.com came up. The thread was basically pharmacists listing places to go to get pharmacy related “informatics” information. My site popped up as a place to go. However, someone correctly pointed out that the blog has been quiet for a while now. This got me thinking, why haven’t I written anything? Or more accurately, why haven’t I posted anything that I’ve written? I sat in my thinking chair and gave this question my full attention. Three things came to mind: 1) lack of something new to write about, 2) a correlation between interest in my job and volume of written material, and 3) content creation and ownership. First and foremost, there’s nothing new and exciting in the world of pharmacy automation and technology. As I have mentioned many, many times before, pharmacy moves at a glacial pace. That hasn’t changed. I’ve racked my brains over the past week to come up with something new and exciting in pharmacy that would be worth putting pen to paper. I came up empty. Nothing, nada, zilch. There are technologies that I still find interesting, like RFID and IV room stuff, but they remain basically unchanged from when I first became interested in them nearly ten years ago. Yes, a decade ago, at least. I continue to stay abreast of many healthcare-related technologies, but most of the effort inside companies these days is focused on integration and electronic health records (EHRs). Good things for healthcare to be sure, but I have almost no interest in EHR’s. And for companies trying to create integrated systems, they’re only kidding themselves. Several companies have been telling me for years that they are “working on a bi-directional interface with [insert system here]”. Some are close or appear to be close, but none that I’m aware of have completed the task. By the time these companies get a completely functional bi-directional interface up and running, it won’t matter. The ship will have sailed, as the saying goes. Case in point, one of my favorite pharmacy technologies five years ago — IV workflow management systems — is dying a slow, painful death. Yes, adoption rates for these systems is the highest it has ever been. However, not only is there a lack of interest in these systems from inside the profession, but companies like EPIC are building many of the same features directly into the EHR. The IV workflow functionality that I’ve seen inside EHRs is limited and poorly designed, but it doesn’t matter because it’s readily available and free. Soon, acute care pharmacies will be using substandard IV workflow management software without giving it a second thought. And once it takes hold, it will almost certainly spell the end for many, if not most, of the companies competing in this space. I found an interesting correlation between my writing and my job. The more interested and engaged I was in my job, the less I wrote. I suppose that makes sense. When I’m bored, I go in search of something to do, hence reading and writing about stuff. For example, for the last 14 months I’ve been working on a project like no other I’ve ever been involved with. From the outside, much of the work would seem mundane and boring. However, it’s work that I had not previously done and the learning curve for the first few months was steep. My interest was held by learning new things about the job. I wasn’t actively seeking anything outside my job to hold my attention. Simple, really. With that said, interest in my job is only a minor reason for the lack of blog posts. The real killer is below. 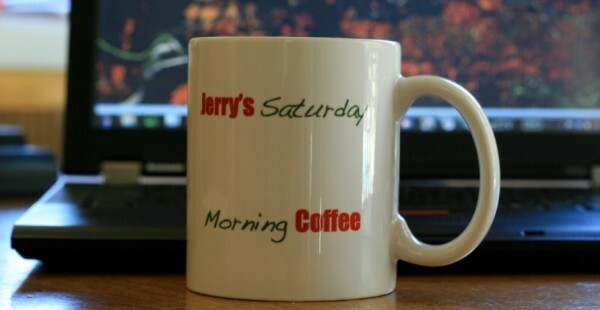 When I started jerryfahrni.com, I never thought that I would have to worry about the things I wrote. But the world is a strange place. When I write something and post it, I’m putting it out there for the world to use however they see fit. Basically, I believe it’s open source. Take it and do whatever you want with it. Some companies, however, wanted to “own” my content, i.e. my thoughts. So I stopped putting my ideas in writing on the web. Not that I was ever going to do anything with them, but it felt wrong that a company could do such a thing. As a result, many of my ideas remain on the pages of notebooks sitting on my bookshelf. Others companies preferred that I not post anything about any of the technologies or processes that they used. And by preferred, I mean they threatened me. That made things difficult. At times, I had to significantly limit what I wrote for fear of reprisal. This was a killer for me. Finally, when I started consulting full time I found it increasingly difficult to be completely frank with my readers. I sometimes worked for companies that made the products I was writing about. I had to be careful not to offend anyone that was or could potentially be a client. Composing blog posts became akin to walking through a virtual minefield. For the most part, I couldn’t find a way around the obstacles described above. Over time, it became so difficult to create content that it was no longer interesting or fun. And when that happens, it’s time to put on the brakes and re-evaluate. I remain interested in pharmacy, especially automation, technology, and workflow design. I still write from time to time, but not often. I still love to talk about this stuff, so if you see me out and about, please engage me in conversation. I am planning to attend ASHP Midyear in December. I’m truly looking forward to it as it will be the first time in many years that I will be attending as “just another pharmacy”. I can see and say whatever I like (smile). For almost a year, I’ve been working as a ‘Pharmacy Project Manager’ on a large healthcare system project to bring all their pharmacy sterile compounding spaces — a.k.a. Cleanrooms, SCA’s, C-SCA’s, etc. — into compliance with USP General Chapters <797> and <800>. Some areas have been remodeled while others have simply been scrapped in favor of a completely new space. The time on this project has been one of the highlights of my 20-plus year career. I’ve learned so much in such a short period. You think you know something until you have to start doing it day in and day out. It’s only then that you realize you know nothing. Here I am a year later and my knowledge base on sterile compounding has increased tenfold. It’s been a great experience. One of the things that I learned early on in this position is that no pharmacy project in California is easy. There are several state and local agencies that have to be involved. And as one might expect, when government agencies get involved, the paperwork, time, money spent, and frustration can escalate quickly. The process for remodeling or building a new sterile compounding area, at least in California, involves at least three agencies: the Office of Statewide Health Planning and Development (OSHPD), the California State Board of Pharmacy (BoP), and the California Department of Public Health (CDPH). Office of Statewide Health Planning and Development (OSHPD): Part of the OSHPD mantra is to “ensure hospital buildings are safe”. They’re basically the organization that looks at your architectural and engineering plans and says yea or nay. My experience has mostly been nay on first glance followed by weeks of back and forth until all parties are satisfied. It’s an interesting process, to say the least. It’s also time-consuming. OSHPD is a real stickler when it comes to anchoring equipment in place in case of an earthquake — noting that California has only had a few major quakes in the past few hundred years. A majority of our quakes are small and cause no damage. But don’t tell that to OSHPD. Their anchoring requirements are, shall we say robust; read that as overkill. The buildings around the anchored equipment will come crashing down long before the equipment will budge an inch. Just sayin’. OSHPD is the first organization to sign off on a project. Once the plans are approved, a building permit may be issued and construction may begin. Once construction is complete, OSHPD inspects the area, and if everything meets code, they sign off and provide a Certificate of Occupancy (C of O) for the space. I honestly don’t know a whole lot about OSHPD. The process is mostly handled by the architects, the project engineers, and the construction folks. I get informed with progress and sometimes provide snippets of information, but for me, the overall process is magic behind the curtains. California State Board of Pharmacy (BoP): The BoP is responsible for ensuring that every pharmacy, or part of a pharmacy, conforms to the requirements set forth by the California Lawbook for Pharmacy. The BoP process starts with submission of an application, license sterile compounding or satellite pharmacy. The BoP reviews the document and either requests changes, which happens a lot, or approves the application and assigns an analyst. The analyst assigns an inspector to the project and a new set of back and forth begins. The inspector often asks for a lot of paperwork before their inspection: copy of sterile compounding PnP, testing and certification results for the room and hood, culture results, “QA” and competency results for staff, cleaning logs, etc. Once the inspector is satisfied with the paperwork — noting that each inspector is different and may ask for different things — they schedule a visit. Assuming the BoP inspection goes smoothly, which is a hit and miss, the inspector will clear the site for licensing. Unfortunately, the inspector doesn’t actually license the space. All they do is notify the analyst assigned to your case that the space has been cleared for licensing. The actual license isn’t official until a new license number is assigned and posted to the BoP website. This can take anywhere from 2-6 weeks after the inspection. The BoP says “2 weeks” but I’ve found that to be inaccurate in almost all cases so far. The fastest I’ve had approval has been two weeks. The longest has been more than six weeks. If you haven’t heard from the BoP in two weeks, I recommend sending them a nudge, “hey, remember us?”. It seems to help. I recommend submitting your application to the BoP at least a couple of months before construction is complete. California Department of Public Health (CDPH): If one were to assume that CDPH is a single organization, one would be only partly correct. For pharmacy projects, the organization is actually broken into multiple groups, each with its own set of requirements and approval processes for every single pharmacy sterile compounding project in California. There’s the CDPH Central Application Unit (CAU), which works with each facility to ensure all necessary paperwork is in order: an HS Form 200 application form, along with a bunch of other paperwork like the OSHPD C of O and Form STD 850 Fire Safety Certificate. It’s quite a process. However, I’ve found that the CDPH CAU is easy to work with. They’re a friendly bunch that appears to want to help. And there’s the CDPH Pharmaceutical Consultant Unit (PCU). As far as I can tell, the existence of the PCU in an official capacity is new. At least it feels new. The PCU requires its own laundry list of paperwork. Seriously, it’s a huge list of stuff. The list includes the C of O for the space, even though the CAU requires it before they notify the PCU inspector; all sterile compounding PnP; temperature, pressure, and cleaning logs; a copy of the pharmacy plans, including HVAC system layout — even though this has already been approved by the engineers at OSHPD; test results for the room and hoods; employee competencies and QA testing; high-resolution photos of the space — even though CDPH PCU has no way to receive files this size and can’t use a file sharing service like Dropbox, Google Drive, or OneDrive from Microsoft. Given my experience with the CDPH PCU, it’s difficult for me to understand their existence. They do almost exactly the same thing as the BoP. See above. It’s a duplication of efforts, to say the least. And in my humble opinion, the PCU doesn’t appear to provide any benefit to the overall health of the project. It doesn’t really matter as going through the PCU for approval of the space is required, so that’s what we do. Fortunately, the PCU inspectors are typically pretty easy to work with. They demand a lot but typically work with you to get it done. The entire CDPH process is a bit convoluted. Once the CAU has everything they need for your new pharmacy sterile compounding area, i.e. they have all the paperwork, they notify the PCU that you’re clear for inspection. The PCU inspector contacts the facility via email or phone and works with them to schedule a field inspection. The inspector comes out, inspects the space, and if it’s good to go — almost never in my experience — they clear the space for use. However, the PCU clearance doesn’t mean you can use the space. The PCU inspector must first notify the local CDPH office with a “recommendation” to approve the space for use. The local office reviews the PCU inspectors report and if they agree with the inspector’s recommendation, which they always do, they notify the inspector of the approval. The inspector then notifies the facility that they’re good to go. Simple, right? Riiiight. I recommend submitting your CAU application 4-6 months in advance of your construction completion date. I recommend contacting the PCU 2-3 months out. It’s better to be on their radar. Building a new sterile compounding space is expensive, time-consuming, and disruptive. Even with the best planning, the regulatory processes in California are going to make you want to pull your hair out and scream. But there’s nothing you can do about it. I’ve found that being informed about the process is the best weapon in your arsenal, and can only help you in the long run. Get educated on the process. Reach out to all the agencies involved and find out what you have to do well in advance of your project. And don’t be afraid to reach out to the inspectors — BoP and CDPH PCU — because they’re there to help you. The surfaces of ceilings, walls, floors, fixtures, shelving, counters, and cabinets in the buffer area shall be smooth, impervious, free from cracks and crevices, and nonshedding, thereby promoting cleanability and minimizing spaces in which microorganisms and other contaminants may accumulate. The surfaces shall be resistant to damage by disinfectant agents. Junctures of ceilings to walls shall be coved or caulked to avoid cracks and crevices where dirt can accumulate… Walls may be constructed of flexible material (e.g., heavy gauge polymer), panels locked together and sealed, or of epoxy-coated gypsum board. It’s common to see pharmacies meet these requirements with hardened drywall and epoxy paint. Recently, I was exposed to an alternative solution: Altro Whiterock. Altro Whiterock is made from a food-safe PVCu polymer that can handle temperatures up to 140°F /60°C. It’s impact resistant, grout-free and has a smooth surface, which makes it easy to clean. It’s also resistant to a host of chemicals and cleaning agents. I’ve had the opportunity to use Altro Whiterock on a few projects. It looks fantastic once installed and really is quite resistant to damage. It’s not completely impervious to damage — I mean you could scratch it if you try — but it’s definitely resistant to routine dings and scratches from stray carts crashing into walls. The only potential downsides are cost and installation. Whiterock is more expensive than drywall and epoxy paint. In addition, only certified installers can install Whiterock. While a bit of a hassle, it’s understandable why you’d want a qualified professional doing the work. And in regards to the cost, you know the saying, you get what you pay for. If you’re thinking about remodeling your pharmacy IV room, you owe it to yourself to give Altro Whiterock a look. Construction on pharmacy cleanrooms is at an all-time high in California. Every hospital I know is either renovating a sterile compounding area — cleanroom or SCA — or building a new one. Why? Because of USP General Chapter <800>, of course. Never have I seen so little cost so much. That little 19-page document has sent shock waves throughout the pharmacy world and created more chaos than anything I’ve witnessed in my 20 plus year career. Whether or not the changes called for in the new chapter will improve patient care and worker safety remains to be seen. That’s a blog post for another time. As pharmacies begin renovating existing sterile compounding areas, or building new ones, there may be a time when they find themselves without a suitable area to make Compounded Sterile Preparations (CSPs). Some pharmacies have the physical space and financial resources to build new sterile compounding areas without vacating their existing space. Others do not. For those that don’t, there are few options. They can potentially get someone else to handle their CSP production while under construction, or they could give everything an immediate-use BUD. Neither is a great option, but options they are. Enter the Mobile Sterile Compounding Unit (MSCU) built by Germfree — aka Mobile Compounding Unit (MCU), “Pharmacy Trailer”, “Rx Trailer”, “the trailer” or as the manufacturer likes to call it, “Rental Compounding Trailer”. I prefer MCU. The MCU is basically a semi-truck trailer with a fully functional pharmacy cleanroom inside. 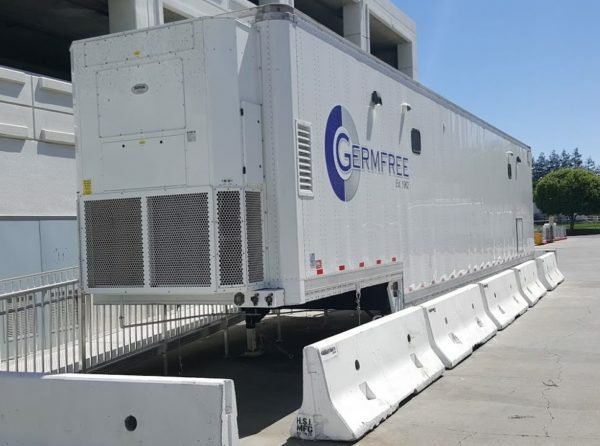 Germfree describes it as a “turnkey rental pharmacy/cleanroom for hospital facility renovations”. I wouldn’t go as far as to call it turnkey, but it’s close. 1) ISO Class 7/8 anteroom with a small area for personnel to don Personal Protective Equipment (PPE). The area has lockers for storing PPE, a hand washing sink, and a gowning bench. 2) ISO Class 7 Negative Pressure Buffer Room (HD room) with Class II, Type A Biological Safety Cabinets, storage space, and integrated refrigerator and freezer. Preparation areas are all stainless steel. 3) ISO Class 7 Positive Pressure Buffer Room (non-HD room) with Laminar Airflow Workstations, storage and integrated refrigerator and freezer. As with the HD room, preparation areas are stainless steel. The trailer has a dedicated HVAC system for temperature and humidity control, an auxiliary generator should you require emergency power, on-board fresh water to provide for a sink, a gray water tank to collect water for disposal, data ports for computers and phones, and a host of cameras with a digital video recorder (DVR) for security. I’ve had the opportunity in my current position to oversee the implementation of a MCU from purchase to fully-operational cleanroom. I’m a few weeks from signing off on the project. Only a bit of regulatory paperwork remains. During my time with the MCU I’ve formed some opinions, which I present to you here. Ready-to-use, sort of. While it takes a little bit of work to get a MCU up and running, they truly are close to being a “turnkey cleanroom”. ISO compliant HD and non-HD buffer rooms. Unlike an SCA, there is no limitation to what can be made in the MCU. It is fully capable of handling any type of CSP. Self-contained, mostly. Once the MCU is tied to water and electricity, pharmacy personnel can work as if they were in any other pharmacy cleanroom. It’s quicker and cheaper than many remodels. I don’t mean to say that MCUs are inexpensive, but I would wager that the cost is less than most major pharmacy remodels or the cost of building a completely new cleanroom. The MCU is nice. Regardless of how you feel about the idea, one thing is for sure, the Germfree MCUs are nice and well-built. Honestly, the HD and non-HD buffer rooms inside the trailer are nicer than many pharmacy cleanrooms I’ve been in. Don’t take my word for it, go visit one yourself. Same hoods that you find in the pharmacy. The same Germfree BZ and BBF hoods you find in pharmacy cleanrooms can be found in the MCU. Lease or buy. Depending on your needs, Germfree offers both. Requires a “flex” or “alternate means of compliance (AMOC)” from state agencies, at least in California. It’s a bit of extra paperwork. Regulatory scrutiny, again California specific. All the state agencies — OSHPD, CDPH, Board of Pharmacy — have taken an aggressive approach to these trailers, which makes getting them up and running a bit of a hassle. Be prepared to do a lot of extra paperwork, including extended policies and procedures, additional trailer-specific training and training, and so on. Requires water, electricity, and internet. This is where calling the trailer self-contained becomes strained. Yes, the trailer has a fresh-water tank and a generator, but those are temporary solutions. Should you need the trailer for an extended period, you will have to find more permanent water and electricity options. Gray water tank. Water used to wash hands has to go somewhere. In this case, it’s a gray water holding tank. Obviously, the tank has to be emptied when it gets full. Depending on how prolific your CSP production is, that could be more than once a week. No restroom. Cross your legs or leave the trailer because there is no bathroom. Customer support/service. I’m sure this will improve over time, but it’s been less than optimal. Limited availability. Apparently, it takes a while to build an MCU, so if you’re in the market for one you should look into it as soon as possible. I love pharmacy IV room workflow and technology, but I don’t get to talk about it much anymore. Most of my conversations these days are focused on IV room regulation, i.e. compliance with USP <797>/<800> and Board of Pharmacy rules. So you can imagine my surprise when two people approached me on two completely different occasions at two unrelated events asking my thoughts on IV room technology. Awesome! Then they asked me what I thought about using robots in the IV room. Bummer. Of all IV room technologies, robotics is my least favorite. Image owned by Jerry Fahrni, Pharm.D. Taken February 12, 2014. Ten years ago, I was optimistic about IV room robots. Today, not so much. If I could sum up my opinion in one sentence, it would be that highly-automated robotic systems for sterile compounding are not ready for prime time. Note that I said highly-automated and not fully-automated. 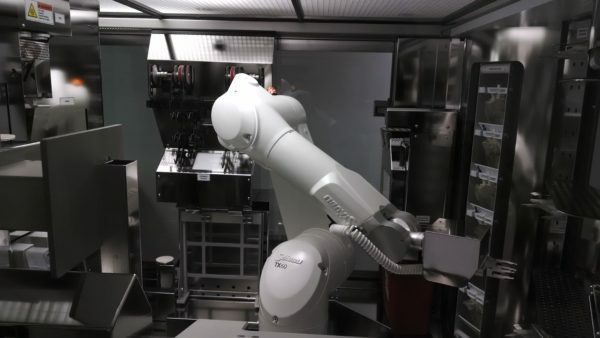 Even though robots replace human hands for the actual compounding process, they are dependent on human hands for moving products in and out of the robot before, during, and after the compounding process. Patient safety – Can robots reduce CSP errors? Certainly, but so can most any IV room technology that utilizes bar-code scanning, gravimetrics, imaging, etc. Often times people will tout robotic systems for consistently compounding drugs within 5% of the prescribed dose. It’s not really a big deal. Doses slightly outside the 5% range are not clinically significant, and getting it within that range is not important enough by itself to warrant the investment in a robotic system. Given proper guidance and a system for compounding, particularly an IV workflow management system, humans can easily be as accurate. Worker protection from hazardous drugs (HDs) – There is no question that IV robots have the potential to reduce worker exposure to HDs during the compounding process. Then again, new USP <800> guidelines do the same. Ever heard of a CSTD? Workflow efficiency – Not sure a robot brings you increased efficiency unless you’re talking about single batch high-volume IV production. I sat for hours watching IV robots doing their thing in pharmacy cleanrooms across the country. I don’t think I ever thought to myself, “dude, that thing sure makes things easier/better”. Cost reduction from moving outsourced CSPs back in house, i.e. no longer having to purchase CSPs from a third party – Not specific to robots. Perhaps for single batch high-volume IV production, but doubtful. Reduced waste from discontinued orders falling off work queues before they are filled – Sure, a robot can help with this, but the same is true for almost any IV workflow management system. Comprehensive documentation for regulatory compliance – These systems certainly collect lots of data but how easy is it to use? Just because the system collects info doesn’t mean you can get it out when you need it. I’ve seen things. Just sayin’. Return on investment (ROI) – What do these systems give back? There are few pharmacies where IV room robots will result in a positive ROI. I’ve seen pharmacies try. While their arguments may sound good on paper, in practice they are as thin as the paper they are written on. The only time these systems yield a real ROI, in my opinion, is when they are used to repetitively compound the same few items over and over again – in other words, batch compounding for high-volume items. All of the systems have roughly the same throughput, which is much lower than that of a highly skilled technician. IntelliFill i.v. is the fastest of all the robots I’ve seen, but it is limited in scope to syringes. Formulary limitations – One of the major limitations of IV robots is the number of formulary items they can handle. During visits to facilities using IV robots — San Francisco, CA; Asheville, NC; Baltimore, MD; Madera, CA; and so on — I saw very few medication “line items” assigned to the robot. The largest number I witnessed was somewhere around 10, and the smallest number was two. Two! Someone had a million-dollar robot making CSPs out of two drugs. Hospital formularies are large and diverse. They include all kinds of IV products: piggybacks, large-volume parenterals, syringes, and so on. Not to mention that formularies change all the time. The inability of these systems to manage a large number of different CSPs at one time is definitely a limitation. Maintenance – What does it cost to maintain these bad boys? They don’t operate on a zero cost. They also don’t maintain themselves. Operational resources required for things like robot maintenance, formulary maintenance, product changes, and so on are important considerations to keep in mind when purchasing a robot. Who is serving who…. or is that who is serving whom? I can never get that right. Anyway, the time, energy, and effort required to keep an IV robot at peak operational efficiency simple isn’t worth it. At least not in my opinion. In a nutshell, I’m just not a fan of the current crop of IV robots. Does that mean that there is no future for robots in sterile compounding? On the contrary, I think we must move toward a future where all CSPs are made by robots. It’s the only thing that makes sense. Unfortunately, that future is still far off. I’ve had the opportunity to peak behind the curtains at a few robots currently under development. There are some great products coming down the pike, but we are going to have to wait a while. Apparently, building robots with creative new features is hard. In a notice posted last Friday, USP announced its intention to postpone the official date of USP Chapter <800> — Hazardous Drugs — Handling in Healthcare Settings. The original date for USP <800> to take effect was July 1, 2018. 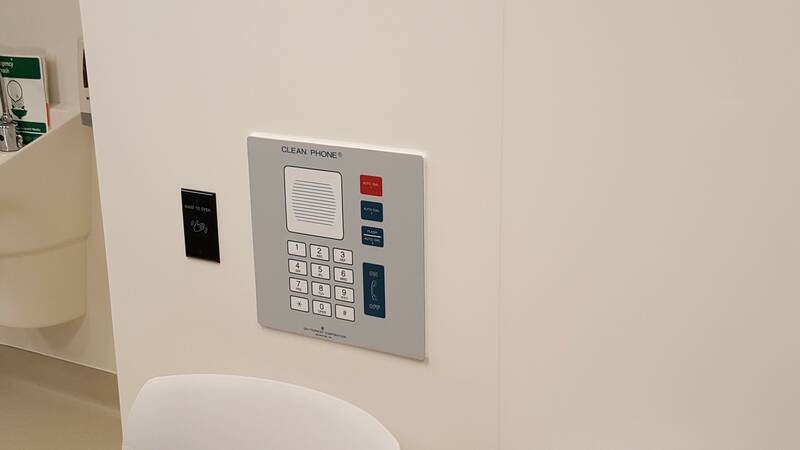 This is good news for many as the July 1, 2018 date has created chaos in pharmacies across the country as they attempt to update their cleanrooms to become compliant. With that said, it’s a bit irresponsible for USP to wait this long to announce the postponement. Many acute care pharmacies are in the middle of lengthy and expensive cleanroom renovations. Not to mention that many state boards of pharmacy have hung their hats on USP <800>. For example, California has already made significant changes to their regulations around hazardous drug compounding. As I’ve written previously, California made significant — and reckless — changes. Unfortunately, this postponement of USP <800> will make matters worse. It’ll be interesting to see how the California Board of Pharmacy handles the postponement. It’ reigned supreme at the box office for a second week in a row, bringing its total domestic gross to nearly $220 million. Not bad for a movie I will never see. I’ve never understood the human psyche that drives people to want to be scared. The world is scary enough already, and it’s free. Speaking of movies, earlier this week my wife and I threw our hard-earned money at American Assassin. It wasn’t a bad movie, but it’s probably not something you’d want to pay full price for either. Michael Keaton is one of the co-stars. He plays an ex-Navy Seal that’s now used by the CIA to train covert spies, i.e. assassins. I swear there was one point in the movie where his character was going off the deep end a bit and all I could think was Beetlejuice. Los Angeles Times: “A state pharmacy inspector made a surprising discovery last year while conducting a routine records review at a Westside facility that compounded drugs for patients at UCLA medical centers…More than 1,000 IV bags of sterile medications for heart patients and others with serious health issues had been made with expired and potentially dangerous ingredients, according to state Board of Pharmacy records.” Oops. The list of expired items included monosodium glutamate monohydrate (MSG) and monosodium aspartate monohydrate (MSA), clopidogrel, mexiletine, and estradiol. The dates on those drugs ranged from November 2015 to September 2016, a month before the inspection. While there is no excuse for using expired medications, it’s likely that no harm would come from it. In fact, the FDA has recently started to question the expiration date practice of drug manufacturers. I was in San Diego last weekend to celebrate my daughter’s birthday. While there, we visited a local mall where Amazon was showcasing the Smart Life Roadshow. Basically a trailer with all kinds of smart appliances connected to the Amazon Alexa. It was pretty cool. I have both an Amazon Alexa and a Google Home. The Alexa resides in my living room and the Google Home in my kitchen. They are similar in many ways, but I prefer the Google Home. My wife, on the other hand, seems to use Alexa more. Just goes to show that there’s a place for all these smart devices. The only thing I find creepy is that they are always listening. My wife drives a 2017 Dodge Charger. Nice car. 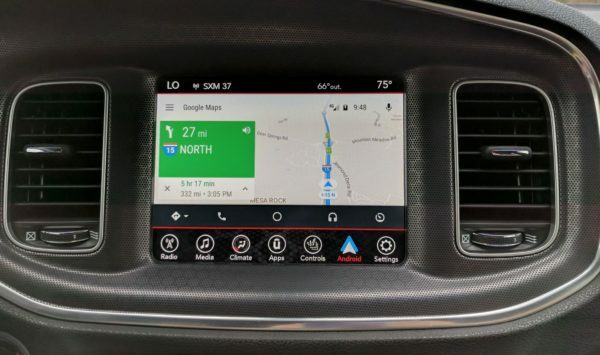 During our trip to San Diego, I had an opportunity to spend a lot of time behind the wheel using Android Auto, which is built into the Charger. Super nice setup. With my phone connected to the car, I was able to do all the things I normally do on my phone via voice control: navigation, look for places to eat or get gas, ask questions, play music via Google Music or Spotify, and so on. Not to mention I was able to use the giant touchscreen in the middle of the dash to do the same. It was cool. Something I’ll definitely look for when I finally decide to replace my truck. Anyone remember Hostess Zingers? I was having a conversation with one of my colleagues this week, and she told me that she had never heard of a Zinger. Those little raspberry cakes of gold are a solid childhood memory for me. Are they no longer a thing? Does that mean I’ve outlived my usefulness because I’m out of touch? Heck no! It means I need to buy her a box of Zingers. Engadget: “Researchers at BYU have introduced a non-interfering solution: A nanofoam cushioning that measures impacts in real-time… The foam can be inserted in helmets and padding to track collisions via electrical signals and wirelessly send the data to tablets and devices held by coaching staff on the sidelines. It’s designed to operate quickly, too, informing coaches how hard a player has been hit — and whether they’re at risk of a concussion and should be pulled off the field.” – Pretty cool. And just for the heck of it, let us all watch how balls of steel are made….